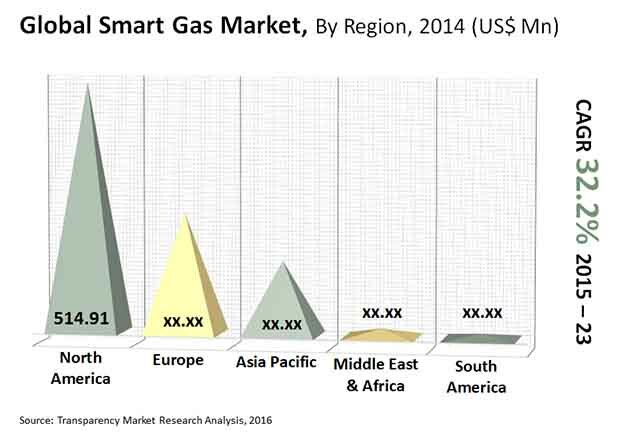 The global smart gas market is moderately fragmented due to the relatively recent emergence of smart gas technology and the resultant intensity of competition caused by the entry of several new players looking to acquire a definitive edge. Itron Inc. is the leading player in the global smart gas market and held a share of 25% in the market in 2014. Despite a slight fall in its market share, Itron Inc. is likely to remain among the leading triumvirate of the global smart gas market in the coming years, which is expected to account for over half the global smart gas market. According to Transparency Market Research (TMR), the global smart gas market is likely to rise to a valuation of US$10.5 bn by the end of 2023. The market was valued at less than US$1 bn around the middle of the ongoing decade, which demonstrates the rapid growth rate expected of the smart gas market in the coming years. By end use, the global smart gas market is segmented into the residential sector, the commercial sector, and the industrial sector. Of these, the residential sector is by far the dominant contributor to the global smart gas market and accounted for approximately three-quarters of the market around the middle of the ongoing decade. The use of smart gas systems is also rising in the industrial sector, which is also likely to remain a key driver for the global smart gas market in the coming years. The demand from the global smart gas market from the commercial and industrial sectors could benefit significantly from the rising government support being given to the installation of smart gas systems in the commercial and industrial sectors. Regionally, the global smart gas market is led by North America, which is likely to account for close to 50% of the global market through the forecast period. Europe is also likely to play a key role in the development of the global smart gas market due to the rising demand for smart gas assemblies in EU countries as well as the UK. Central European countries such as Germany, Italy, the Netherlands, Belgium, and France are likely to emerge as key contributors in the global smart gas market in the coming years. The rapid industrialization and urbanization in Asia Pacific will also ensure steady growth of the smart gas market in countries such as China and India. The prime driver for the global smart gas market is the increasing amount of economic and regulatory support being provided to the smart gas sector by governments in developed as well as developing nations. Developed countries in North America and Europe have benefitted significantly from this; government support is also likely to remain a key factor for the global smart gas market in the coming years due to the rising economic support being given in Central Europe. Governments in developing countries such as China, India, and Japan have also taken a keen interest in the global smart gas market, as widespread installation of smart gas systems has a significant impact on the economical dynamics of a country. The increasing adoption of smart metering technology in emerging regions is likely to be vital for the global smart gas market, as individual entities in such countries often lack the resources to install smart gas systems. The smart gas market has a significant gap to overcome in the residential sector in emerging countries, which is likely to be filled up rapidly in the coming years.